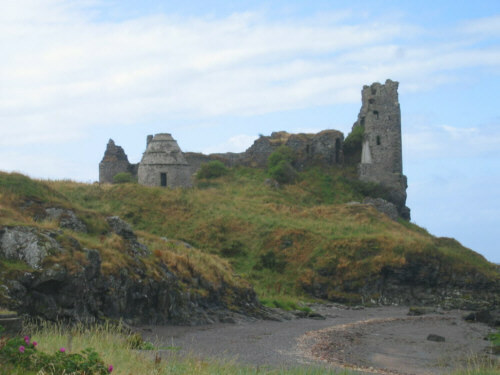 This is a picture of Dunure Castle overlooking Ayr Bay in the Firth of Clyde, on the west coast of Scotland. All that remains of the castle are these ruins, which are of a later period than the original structure (which was built before the 13th century). The castle was the ancient seat of the Kennedys of Carrick, who were granted the lands in 1357. In 1509, David Kennedy was created 1st Earl of Cassillis. The 4th Earl of Cassillis, Gilbert Kennedy, was reputed to have entertained Mary Queen of Scots from 4th to 7th August 1563 during her third progress, which took her to the west of the country.